The Jade Notebook by Laura Resau . A Notebook Series Book. Review: When a girl who has been traveling all over the world in search of her lost father accomplishes what she has been yearning to accomplish her whole life, she finds that even paradise has its dark side. 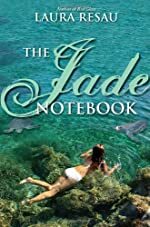 The Jade Notebook, the third book in the Notebook series is written by Laura Resau, tells the tale of a girl who seeks the truth. A girl who seeks her truth. All her life, Zeeta and her mother have been traveling the world, to experience the different cultures, but also in an endless search of Zeeta's father. Until it finally does come to an end. Zeeta and her mother, Layla land themselves in Mazunte, Mexico, her father's homeland. Zeeta had always dreamed of a place much like Mazunte, a place where she could relax in the bright sun, dip in the cool ocean, and feel the gritty sand between her toes whenever she takes a walkÉparadise. Her true love, Wendell, had an internship photographing rare sea turtles in Mazunte as well, but after decided that she wanted to make Mazunte her home permanently, she discovers that everything and everyone have their dark sides, even Mazunte. As Wendell and Zeeta dig deeper, they discover that Zeeta's father had a hidden past, a dark secret that has been buried for years. Maybe paradise isn't all that great. Maybe the howling in the jungles isn't just the wind, and the sharks that Òglide in the crystal watersÓ aren't just satisfied with seafood. And what about the poachers that raid the beach at night for turtle eggs when everyone- almost everyone is asleep? Laura Resau's writing style is spectacular, and I loved the plot! Who would have guessed? I certainly didn't, and I am quite surprised that I had no trouble understand the plot despite the hard fact that this is the third book. The story had so many intricate twists and turns, I could hardly keep up! But since I did, I'm glad, because The Jade Notebook is certainly a book I would recommend for kids and adults of all ages. This book really shows the importance of family, and the power of perseverance. I rate The Jade Notebook five stars, and cannot wait to read the books that come afterwards. I loved how descriptive Resau was, and I could practically see the scenes be played out in my mind. Review written by Tam (7th grade student). We would like to thank Random House for providing a copy of The Jade Notebook for this review. Have you read The Jade Notebook? How would you rate it?